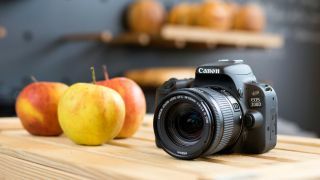 Entry-level DSLRs like the Canon EOS 200D – also known as the Canon EOS Rebel SL2 – are arguably some of the most exciting on the market. Sure, they may lack the fancy tricks of their pricier stablemates, but the latest generation packs a high-level of functionality into small, light bodies, and are affordable enough to make them accessible to anyone. They're also great backup bodies for pricier cameras, or as primary cameras for holidays and when looking to travel light – and the Canon EOS 200D ticks all these boxes. Inside a body that weighs just 453g (including the battery and card), the camera sports a 24.2MP APS-C sensor that's equipped with Canon's excellent Dual Pixel CMOS AF system. This feature, which hasn't featured in Canon DSLR body pitched at this level, lets you focus smoothly when using live view and video recording, an area where DSLRs tend to struggle. You also get a 3in LCD that not only flips out from the body and turns all the way around to face the front, but also responds to a range of different touch commands. Furthermore, once you've captured your masterpieces, you can ping them out to the wider world through Wi-Fi, NFC or Bluetooth, so you can leave those cables and card readers at home. There's heaps more to get excited about, from Canon's very latest DIGIC 7 processing engine and 5fps burst shooting through to a raft of Creative Filters for instant image and video effects. The camera's built-in flash is complemented by the option to use an external unit for more power too, so you'll find the EOS 200D perfect for low-light shooting or outdoor portraiture, where you may wish to use this. As we found in our full review, image quality is also commendable, with good colours and low noise levels, although there's lots of competition at this price point from the likes of the Fujifilm X-T20 and the Nikon D5600, and these are also excellent in their own right. Scroll down for more details on the specs and to get the best price on the Canon EOS 200D / EOS Rebel SL2.